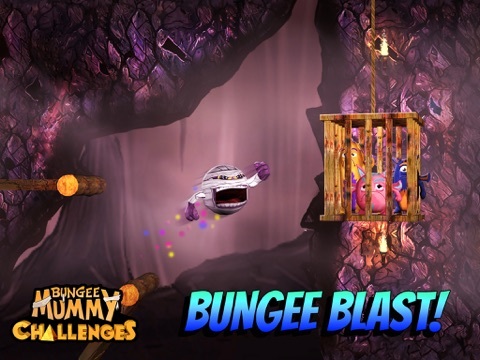 Bungee Mummy: Challenges app: insight & download. Compatibility: Requires iOS 7.1 & up. The funny but helpless Geemies are relying on you - their survival is in your hands! Tap, swipe, pull, and flick to master this exciting easytouch, free arcade game. Make your unkilled mummy ball jump like spiderman and shuffle up, down, and sideways on crumbling pillars like surfers riding the tide to help King Phero save the Geemies! 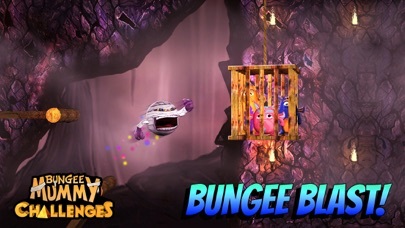 • BUNGEE BLAST - Bungee launch through the cages and boom them to help the Geemies run and escape to survival. How many can you save? Expect heavy surprises as the challenge gets harder! • SNAKE SMASH - Prepare for mortal kombat with fishy snakes and scorpions but avoid the inquisitive, lovable Geemies! Speedy and sharp reflexes are needed to win fanduel - it’s between your smashy hopper and the clock. • CRATE ESCAPE - Drop valuable supplies into the escaping carts for the Geemies. There is a limited amount of crates to drop and time is tight so make sure you don’t miss the carts. Think ahead, survival depends on your sharp mind! • WHEEL OF MISFORTUNE - Collect as many arcane scarabs as possible while surviving the booby trapped and riddled Wheel of Misfortune! Prepare for unstable structures and mortal fire ahead. 29 August 2015 : Free!